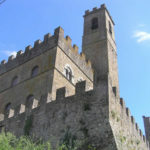 Castello dei Conti Guidi, Poppi, Arezzo. Author and Copyright Marco Ramerini. 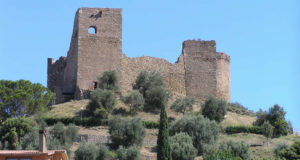 From a distance the structure that characterizes the village of Poppi is undoubtedly the Castle of the Counts Guidi (or Praetorian Palace), which, with its massive structure dominates the town on the hilltop, but the town is very beautiful even for its porches. 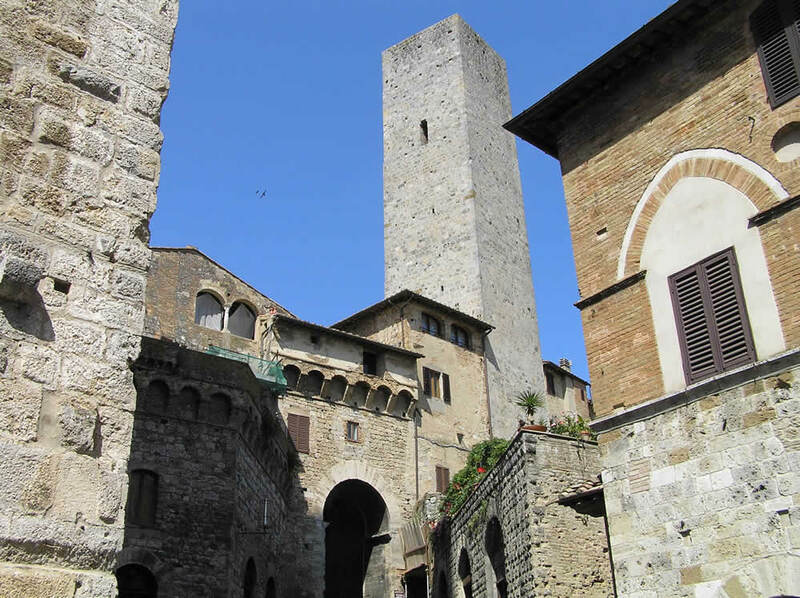 Poppi’s history dates back to the twelfth century when it became the main residence of the Counts Guidi, in 1440 it came under the dominion of Florence. 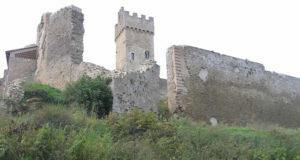 Poppi Castle was first built in the twelfth century, but then rebuilt in the thirteenth century. 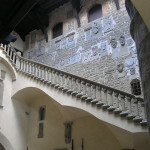 On the front door of the castle overlooking a stone lion of 1447, is certainly worth a visit inside the castle, which is accessed via a scenic courtyard with coats of arms of Florentine vicars and a beautiful staircase. 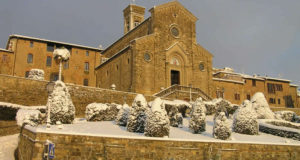 Walking along the town should visit the small church with a dome of Madonna del Morbo (1657-1705) set in beautiful location in the center of a square and lined with arcades that characterize the town. 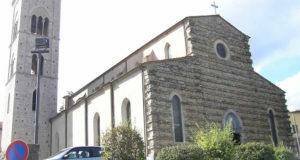 On one side is the church of San Marco and Lorenzo (17th century). 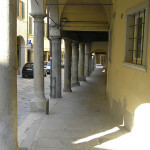 Along the beautiful arcades of Via Cavour (to the right coming from the castle), we arrive at the Abbey of San Fedele (1185-1195), which preserves valuable works of thirteenth-sixteenth centuries, including works by Francesco Morandini (called the Poppi), the Maestro della Maddalena and the school of Giotto. 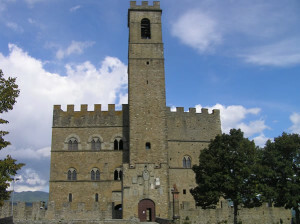 The crypt containing the remains of San Torello, a saint native of Poppi (1202-1282). 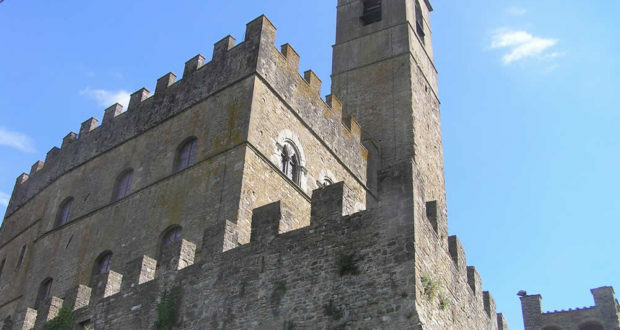 Opening of the Castle of the Counts Guidi: March 15 to October 31. Open daily: 10-18; July 1 to August 31. Open daily: 10-19; November 1 to March 15. Closed: Monday, Tuesday, Wednesday. Open: Thursday, Friday, Saturday, Sunday: 10-17. 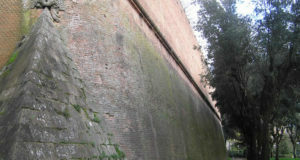 Admission: Full price 4 Euro; reduced 3 Euro. 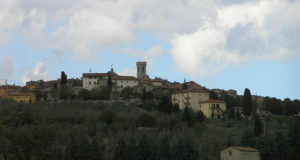 Poppi is on top of a hill at 437 metres in Casentino, in the province of Arezzo, town which is about 40 km. By Car: To reach Poppi from Arezzo must travel the road n° 71 that leads to Bibbiena, shortly after Bibbiena, turn left on the road to Consuma (n° 70) and after about 5 km you reach the village. 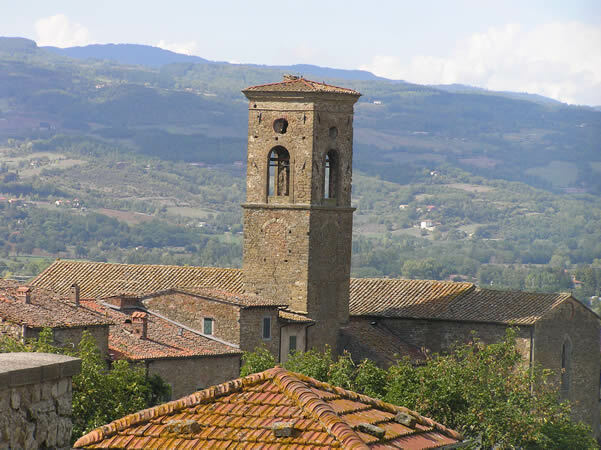 From Florence, the village can be reached with a road of about 55 km from Pontassieve and then along the beautiful mountain pass of Consuma. 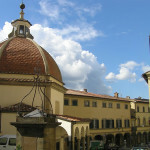 Road distances from Poppi: Arezzo 39 km, Florence 54 km. 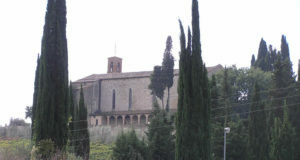 By Bus: Poppi is connected by SITA bus services with Florence: Linea 320 S: Firenze, Consuma, Stia, Bibbiena. 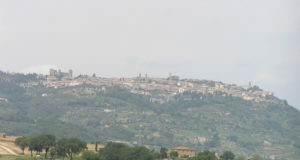 Linea SI90: Firenze, Consuma, Stia, Bibbiena. 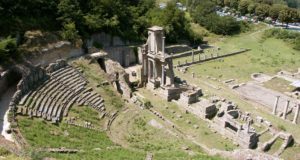 Numerosi sono poi i collegamenti con i paesi vicini effettuati dalla LFI: Linea H10: Corsalone, Bibbiena, Soci. 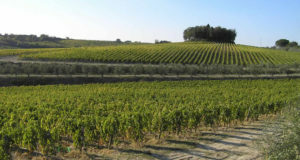 Linea H2: Bibbiena, Partina, Badia Prataglia, San Piero in Bagno. Linea H3: Moggiona, Camaldoli, Serravalle, Soci, Bibbiena. 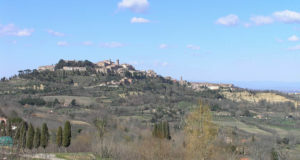 Linea H4: Cetica, Strada, Borgo alla Collina, Bibbiena. 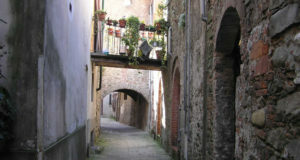 Linea H42: Montemignaio, Strada in Casentino, Borgo alla Collina. 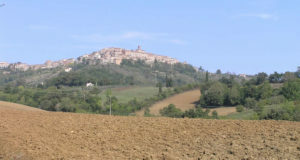 Linea H6: Bibbiena, Ortignano, Raggiolo. 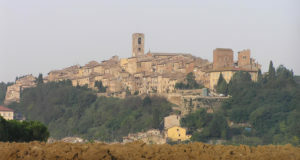 By Train: Poppi is served by its own railway station on the railway line Arezzo-Stia. 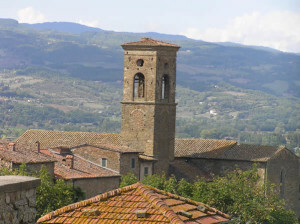 These stops are made along the line: Arezzo, Casello 1, P. Ceciliano, Giovi, Capolona, Subbiano, Baciano, Calbenzano, S. Mama, Rassina, Corsalone, Bibbiena, Memmenano, Poppi, Porrena, Pratovecchio, Stia. 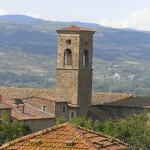 The nearest important railway station is that of Arezzo which is 39 km. By Air: The nearest airport is Florence-Peretola Amerigo Vespucci, which is 78 km away. 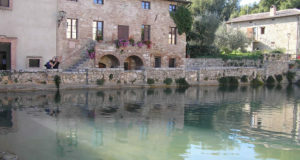 Weekly Market Ponte a Poppi: Tuesday Weekly Market in Ponte a Poppi, every Tuesday from 8.00 to 13.30. 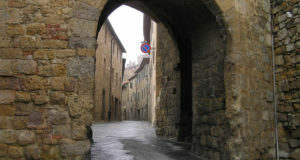 The porches of Poppi, Arezzo. 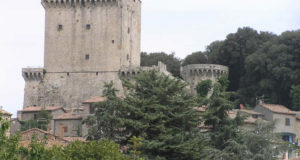 Author and Copyright Marco Ramerini. 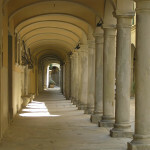 The courtyard of the Castle of the Counts Guidi, Poppi, Arezzo. Author and Copyright Marco Ramerini. 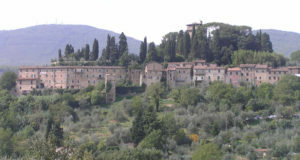 Part of the village of Poppi and the Abbey of San Fedele, Poppi, Arezzo. Author and Copyright Marco Ramerini. 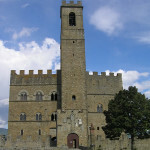 The Church of Madonna del Morbo, Poppi, Arezzo. Author and Copyright Marco Ramerini.